In Part I of ‘On Being Ruined by a Fondness for Beer’, I sketched the life of Derwent Moultrie Coleridge, grandson of the opium-addled poet Samuel Taylor Coleridge, until his arrival in Australia in 1851. Here is a quick re-cap: the young Coleridge was born in Cornwall in 1828; he completed his early education in London (excelling mostly at hairstyles and fashion); in 1847, he went up to Oxford where he was rusticated (effectively expelled) during his first year; in 1848, he tried his luck at Jesus College, Cambridge, but the outcome was much the same—Coleridge was confirmed as a spendthrift, a womaniser and a carouser. Derwent and Mary Coleridge. Unknown photographer, 1856. NPG P322 © National Portrait Gallery, London. Coleridge’s parents, wearied by his ‘career of reckless dissipation’ (Hainton, p. 234), decided to pack him off to the Antipodes with a small quantity of cash and a fond hope that he would redeem himself—or at least be far enough removed from them so as to cause no further embarrassment. 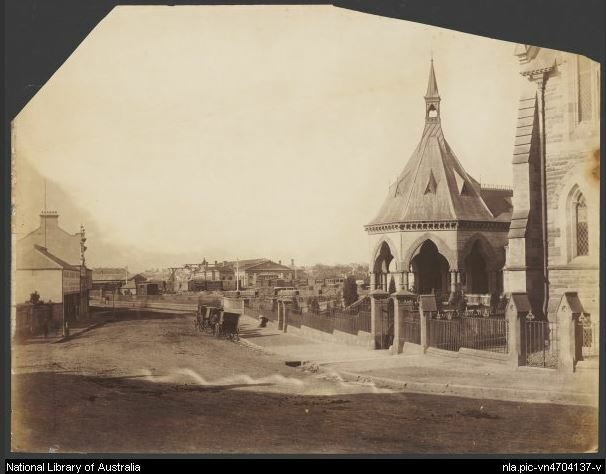 A family connection provided the Coleridges with an introduction to the explorer and South Australian Colonial Secretary Charles Sturt. The plan was that Sturt would administer minimal funds until the young man found regular employment. On the eve of his departure, Coleridge wrote to his mother: ‘As you read this I shall be on my way to a new world, to find new friends, to lead, I hope in all ways, a new life. What I shall do wherewith to gain my bread I know not … I may even now … become an honest upright man’ (qtd in Hainton, p. 236). Departure of Emigration Ship. Illustrated London News, 6 July 1850: 16. Despite his best hopes, Coleridge did not make an auspicious start. Nearly two years passed before he made contact with his family. Again writing to his mother (qtd in Hainton, p. 237), he relayed the ‘almost insurmountable’ difficulties of his life in South Australia. He had struggled to find work and had often gone without food or shelter. When Sturt had been unable to find suitable employment for the young man, Coleridge had briefly joined a road gang. His next job was with a publican’s family where he lasted only five weeks. (Finding the workload disagreeable, he gave his master a horsewhipping.) Positions in bars and mines followed before he decided to head for the goldfields, but after three weeks of arduous trudging, and with his shoes worn out, he settled—temporarily—on work at a sheep station. Then, continuing his migration eastwards, he took jobs with the police in Victoria. Eventually, Coleridge found an occupation that suited him better: he became a Resident Assistant Master at the newly-established Geelong Grammar School. 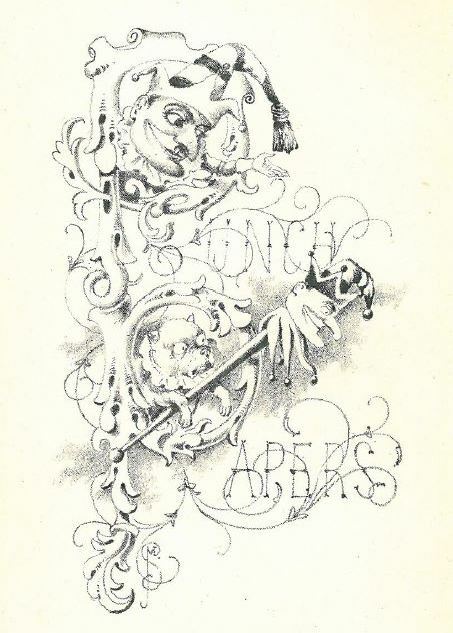 When he joined the staff in 1859, the school boasted a principal who had studied at Oxford, a vice-principal who hailed from St John’s College, Cambridge, and two further assistant masters with qualifications from King’s College, London, and Trinity College, Dublin. Early Geelong Grammar School Building, completed 1857. Image sourced via Wayback Machine. At last, life seemed more promising. In a letter dated 10 February 1859 (qtd in Persse, p. 114), Coleridge swoons with delight over his new situation at Geelong Grammar. ‘The tone here is so high’, he says, ‘quite up to an English public school’. 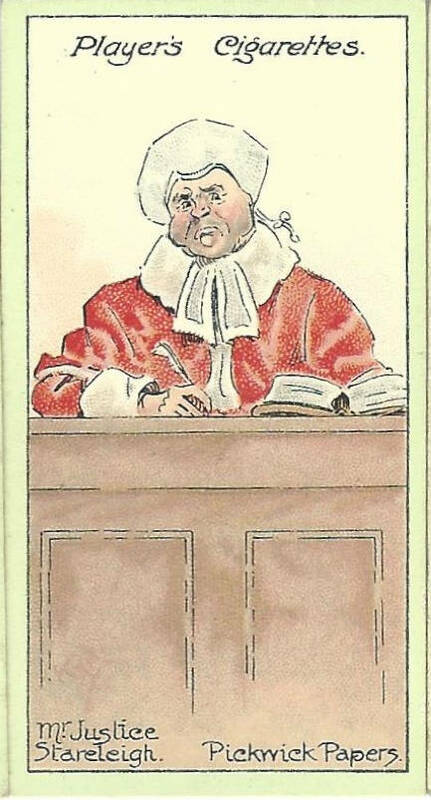 He happily recites his grandfather’s poetry to the students, he lounges around after supper reading Tennyson and Longfellow with his fellow masters, and he plays cricket on Saturdays (the latter recreation affording ‘no end of openings for incipient flirtations’). In March, he writes that he has been accepted into the local Literary and Scientific Association, and has gained his first promotion at the school. He is also visiting ‘some really good families—Clergy, Doctors and Trustees of the School’ (115). He even writes of returning to England (between terms) ‘to matriculate at the University’ (116). Coleridge’s self-declared hope of establishing an honest and upright life with new friends seems to be coming to fruition. By April 1859, there is the prospect of a rise in salary; he is leading a ‘quiet life’; he has ‘entree to all good houses in Geelong’; and his friends are solid ‘family folk’. He is even introduced to the Governor of Victoria. ‘So you see’, he reassures his mother, ‘I’m in the land of grandeur and good things’. Coleridge’s good fortune did not last. At the end of 1859, Geelong Grammar School closed (albeit temporarily). Student numbers had not reached expected levels; lower than anticipated income had led to a debt of £7,000; and the school had lost its battle for educational supremacy with its rival, the Geelong National Grammar School. The teaching job that had promised salvation for Coleridge came to an abrupt end. And so, as Shakespeare’s Henry V would have it: ‘Once more unto the breach, dear friends, once more’. Coleridge starts over in Melbourne. 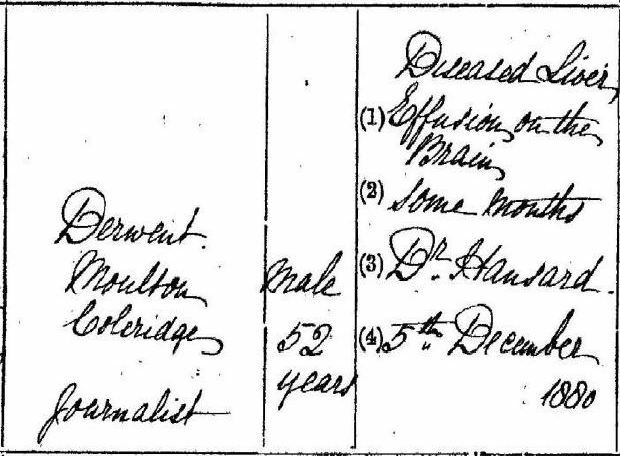 According to The Unknown Coleridge (a biography of Coleridge’s father), the 32-year-old Coleridge took up a post at Brighton Park School, but that job did not last long, and nor did his next position in a survey office. In 1863, Coleridge makes the decision to return to England. Once there, he travels to the Lake District and the Isle of Man with his father, and follows this journey with a seven-week tour of Switzerland and Germany with a small party of family and family friends. His parents press him to remain in England, but, after a further six months, Coleridge decides to return to Australia. He sails on the Royal Albert with 53 other passengers—44 travelling steerage and 10, including Coleridge, in saloon class. Paying for the more expensive saloon passage entitles Coleridge to the privacy of a cabin, superior catering, and the advantage of promenade space on the poop deck—a world away from those languishing below deck in steerage. State Records Authority of New South Wales: Shipping Master’s Office; Passengers Arriving 1855 – 1922. St Mark’s Collegiate School. Advertisement, Sydney Morning Herald, 6 July 1864: 6. Coleridge must have arranged a teaching position in New South Wales prior to his departure from England. 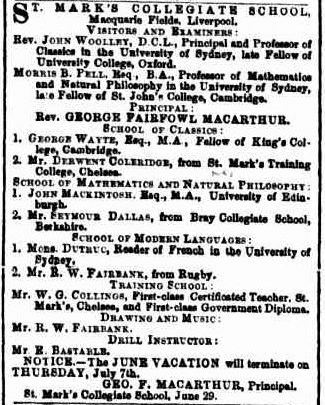 He docks in Sydney on Wednesday, 10 August 1864, but an advertisement for St Mark’s Collegiate School in Macquarie Fields, near Liverpool, had appeared in The Sydney Morning Herald a month earlier. It named Coleridge as a staff member in the Classics Department. The address listed beside his name is that of his father’s teacher training college in Chelsea. Another staff member at Coleridge’s new school, W G Collings, is a graduate of that same London establishment. Perhaps everything will turn out well after all. Coleridge is still a relatively young man, just shy of his 36th birthday, and he has a new job in a reputable school (the headmaster of which is George Fairfowl Macarthur, great nephew of the pastoralist John Macarthur). So, what happens next? History repeats itself. 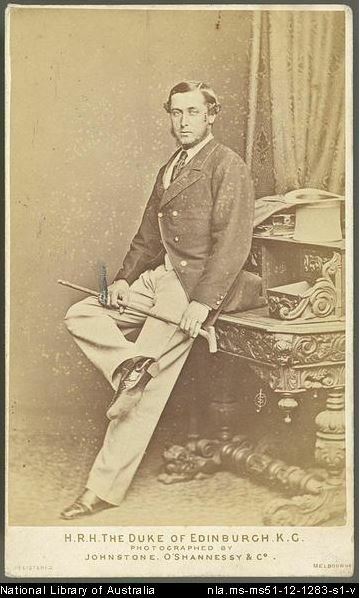 In late 1868, George Macarthur accepts the position of headmaster at his alma mater, The King’s School, Sydney. Some of his masters and students accompany him to King’s, and St Mark’s Collegiate School closes down. 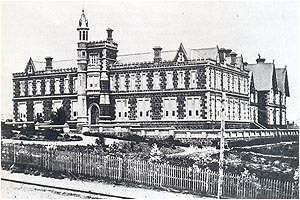 It is not certain that Coleridge was still working at the school at the time of the closure, but what is certain is that by the following year the name ‘Derwent Moultrie Coleridge, teacher’ begins to appear in the entry logs of Darlinghurst Gaol. Darlinghurst Gaol log book, 25 October 1869. Eleven years later, Coleridge is dead. But by then, he has left his mark—literally—in the pages of Sydney’s colonial history, his name permanently linked with such eminent persons as the explorer W C Wentworth and Queen Victoria’s second son, Prince Alfred. This last phase of Coleridge’s life will be explored in the third and final part of ‘On Being Ruined by a Fondness for Beer’. My thanks to the Geelong Grammar School Archivist for searching out information on Derwent Moultrie Coleridge, and thanks also to the Friends of Samuel Taylor Coleridge (@FriendsofSTC) for alerting me to the Haintons’ biography of Coleridge’s father. 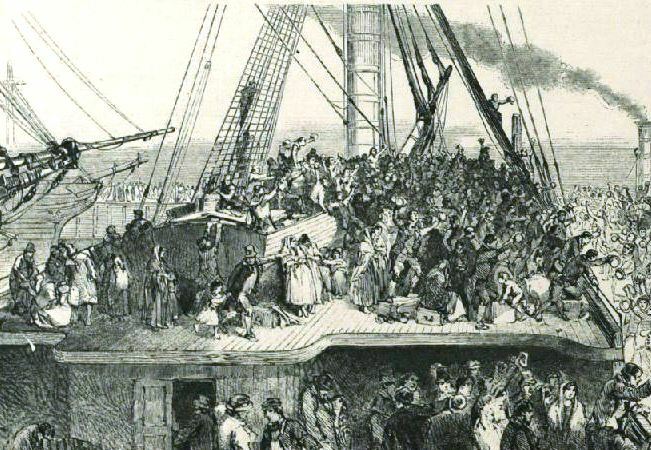 ‘Departures.’ Illustrated London News. 22 January 1949: 106. Derwent Coleridge; Mary Coleridge (née Pridham). Unknown photographer. 1856. 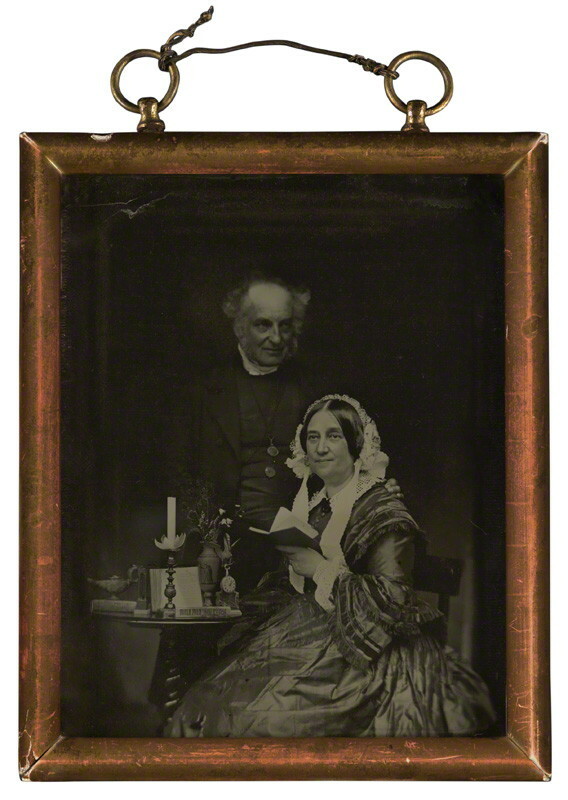 NPG P322 © National Portrait Gallery, London. Reproduced under Creation Commons Attribution (CC BY-NC-ND 3.0). ‘Some Letters from Derwent M Coleridge’ in Persse, Michael, and Justin Corfield. Geelong Grammarians: A Biographical Register (1st ed). Corio, Vic: Geelong Grammar School in association with Geelong Grammar Foundation & the Old Geelong Grammarians, 1996. Geelong Grammar School building at the time of Coleridge’s employment (on the site bounded by Moorabool, McKillop, Yarra and Maude Streets). Image sourced via cached GGS website, Wayback Machine. ‘Mariners and Ships in Australian Waters: Royal Albert.’ State Records Authority of New South Wales: Shipping Master’s Office; Passengers Arriving 1855‒1922. ‘Advertising.’ The Sydney Morning Herald. 6 July 1864: 6. ‘Macquarie Fields: One of Our Earliest Schools.’ The Sydney Morning Herald. 1 August 1931: 7.